Visitors in Station Hostel will enjoy its excellent loaction, the good transport connections and the individual attention paid every guest. 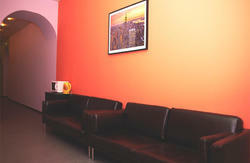 Station Hostel offers 4 comfortably finished rooms offering all conveniences. First room is for two persons, second - for three persons, third - for maximum five and the last one - for maximum 10 persons. 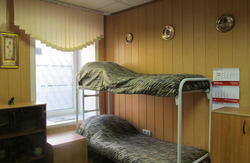 Also we can offer additional beds (the same size with the regular beds). Luggage room, self-service kitchen, Tea and coffee, hairdryer, Iron and ironing board, Sewing Kit, Local Phone, first aid kit. Paid services: Visa support and registration, slippers. We offer beautiful cake or 6 cup cakes for birthday person who celebrates his birthday in our hostel and also for honeymoon couples (just for people staying in the double and family room). - Please contact us before you arrive and we will prepare a sweet surprise for you. Smoking is only permitted in special area designed. the code on this gates is '2007B' on the left wall near the gates, then gates will open, go inside and after the arch turn to the left and you will see the entrance where you should dial '4B' (the sign 'Station Hostel' is on the door).